For as long as I can remember, I have been annoyed by tattoos. Well, mainly the kind that are prominently displayed, especially on people’s torsos. And for as long as I’ve been bothered by them, I’ve wondered why they bug me. After all, people adorn their bodies in all sorts of other ways—with jewelry, piercings, make-up, etc.—and those things don’t usually annoy me. So why tattoos? My frustration at not knowing why they bother me so much has only been aggravated by the fact that, apparently, they bother many other people too. Yet, as I’ve discussed the matter with a lot of folks who feel the same way, they are almost always at a loss to explain their displeasure and usually throw it up to inexplicable personal distaste. Well, recently the reason for my distaste finally dawned on me, and so I will now share it with you, gentle reader. We’ve all had the experience of encountering the elaborate dragon, butterfly, skull, jungle scene, abstract image or geometrical shape tatted on the back of that guy or gal in front of us at the grocery store, and we’ve been impressed by the exquisite detail or perhaps completely perplexed by what we were seeing. Then when s/he suddenly turned around, we looked away just in time before the person caught us gawking at her/him. Whew. But, then again, while staring at the tattoo, was it really her/him we were looking at? 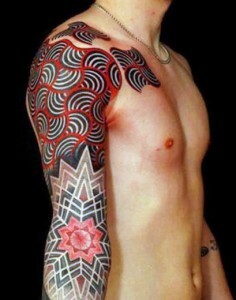 Tattoos are typically intended to be artistic or, one might say, even genuine works of art. And works of art are supposed to be enjoyable objects of aesthetic pleasure. Art works also welcome study and analysis, and in the case of visual arts this means careful and extensive visual examination. However, the bodies of fellow human beings whom we do not know very well are not properly objects of intensive visual study. To stare at or closely examine another person’s body in public is, well, rude and inappropriate. And there lies the problem with many tattoos, it seems to me. A prominent, eye-catching tattoo invites or tempts others, even complete strangers, to closely examine the person’s body—that is, to do something that is rude and inappropriate. And the stronger one’s visual aesthetic sensibility, it would seem the stronger that temptation will likely be. Now the tattoo fan will likely respond here by saying “too bad, just ignore it.” Well, of course, that’s just what I struggle to do every time I encounter someone in public who has a prominent tattoo. I restrain myself and look away—anywhere but at that person’s body. But in doing so, I must exert mental energy to avoid doing so. And, the more artistic and aesthetically interesting the tattoo, the more mental energy I must expend and the harder I must work to distract myself from looking at the image. Now here’s an analogy. We all know—or should know, anyway—that it’s often rude to whistle tunes in public spaces. While the whistler might enjoy the melody s/he is making, it is unwelcome to others and a sonic distraction. Of course, the whistler might say, “too bad, just ignore it.” But that is to give oneself license to sonically impose on others for the sake of their own “art.” Yes, we can ignore it, but many times that’s difficult, and it requires an extra exertion of mental energy to do so. Which is why the whistling is rude and inconsiderate. Similarly, prominent tattoos are an imposition on others—a visual imposition that places a burden on others to exert a bit more mental energy to “ignore” it. And, similarly, it is rude and inconsiderate. But what’s worse in the case of tattoos, the imposition they place on others is also a temptation to do something inappropriate—gawk at a stranger’s body in public. So as annoying as the public whistler is, at least they don’t tempt me to do something inappropriate (assuming their whistling isn’t so bad that I’m tempted to slug them). In sum, then, prominent tattoos are a rude imposition on others, as they invite people to see the human body as an object and in so doing tempt them to do something inappropriate. That’s why tattoos bug me. And perhaps that’s why they bug you, too. So this whole article reeks of “That lady was wearing a short skirt. I HAD to wolf whistle at her. How am I supposed to contain myself?”. Honestly, replace the word “tattoo” with “shirt” in this blog post, and you can see how foolish it seems to regular humans.